Here at Papered Wonders, we love paper! We also love words and combining design with written insight is icing on the cake! One of our dear clients, Joy Pittman from The LOFT at Castleberry Hill, is sponsoring an event today at her venue. She wanted to tell her visitors that their holiday party was “mint” to be at The LOFT. 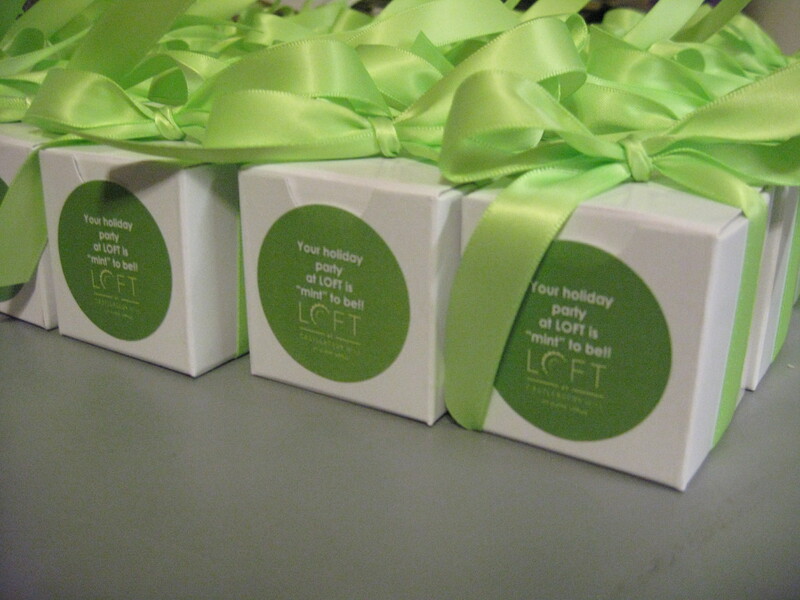 So we took it and ran with it and created favor boxes with chocolate mints inside! We topped it off with a satin green ribbon. These favor boxes are sure to add just the right amount of color to get Joy’s visitors in the Christmas spirit! Do you have an idea to turn an old crowd favorite into something fresh and innovative. Provide us with your purpose and we’ll create a papered wonder that is sure to be practical, but perfect for your occasion. Do you wonder how we do it? Oops! No pun intended!